Yep, Annabelle has now reached that toddler milestone of sucking liquid through a straw! What? You thought I meant something else? Not a chance. My kids are awesome!! Annabelle has been attempting to drink from a straw for quite some time now, but just hadn't quite put it all together. 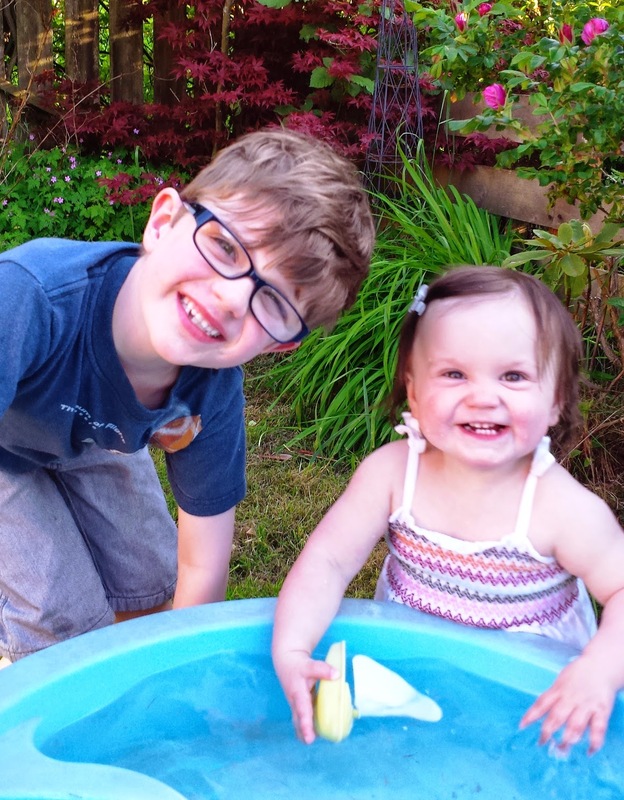 We knew she was overdue to do so, being 18 months old now, but we weren't too concerned knowing that all kids reach milestones at their own pace. You could tell she knew what the concept was, but just couldn't quite figure it out. 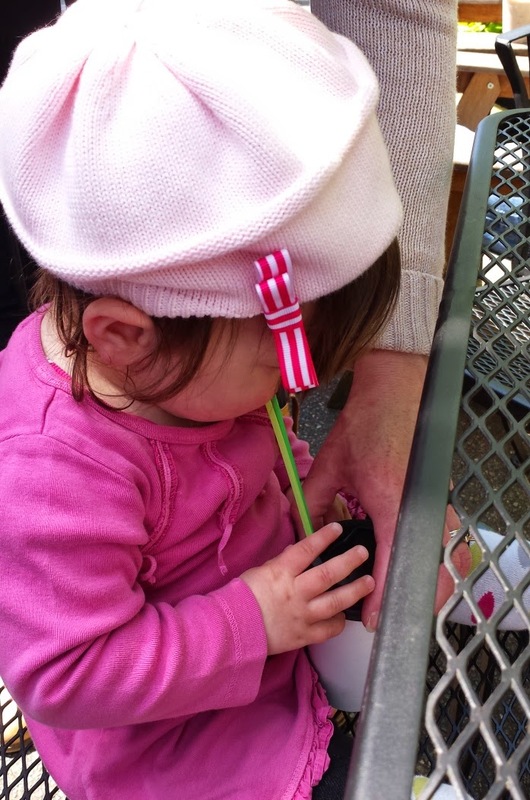 It wasn't until we ordered a little flavored milk for her from one of our favorite local coffee houses that she had the incentive to draw the liquid out of the cup. Since then, she has also took draws off of an apple granita from our local farmers market, which she also loved. I actually wrote about this same subject early in the life of this blog, when Lukas was a toddler himself. I called that post The First Straw. This all just serves to prove that even the smallest milestones can be a lot of fun. Happy Memorial Day weekend all. Be safe and enjoy yourselves. Yes, I'm predicting an earthquake readers. It'll happen soon, mark my words. I can tell this because of the animals. Yes, the animals. They were acting pretty strange today. And haven't we all heard at least one of those stories where the animals go a bit crazy juuuuust before an earthquake, or a volcano erupting? I know I have. In fact, I distinctly remember reading a story about some pygmy goats freaking out just before Mt St. Helens blew it's top back in 1980. I was in Little League that year, and it was cancelled because of the ash. That's not really relevant, other than for me to remember my glory days of Little League. 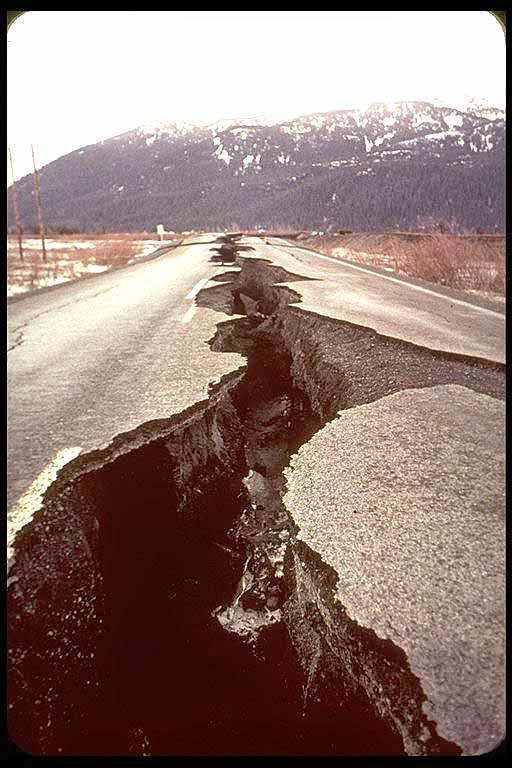 Anyway, back to the earthquake. It all started today while I was getting Annabelle ready for daycare. At the same time Mrs. LIAYF was getting Lukas ready for school in the upstairs bathroom, when he happened to look over at the open window and see a raccoon peeking in on them. A RACCOON! It apparently scampered off right away, but it was being a rather strange Peeping Tom in the full daylight, on our 2nd story roof. When they told me what happened, I looked out the window and a large black crow was sitting in the same spot. It flew off when I stuck my head out the window, but I could have sworn it gave me a weird stare before it did. I know! Very odd. Then a bit later, when we were all in they foyer getting our shoes on before leaving for school I looked down and right there between all four of us was a dead mouse! We all let out a collective "Ewwww", especially when I picked it up by the tail with a paper towel and tried to keep Annabelle from seeing. Unfortunately it was barely in one piece. Yes Ewwww. Normally a dead mouse wouldn't be considered too odd, but this was the 2nd dead mouse this week. This from a cat we have had for over 10 years, and who hasn't ever killed a mouse before. It was very strange. Stranger still, after we left Mrs. LIAYF found what can only be described as a horror scene in Annabelle's play area off the kitchen, where our cat had killed the mouse. I'll skip all the bloody details, of which there were apparently enough of them to make even the cast of CSI cringe. But I will say that Annabelle's tiny plastic shopping cart, the one she wheels around all her shiny possessions in - kinda like a tiny transient magpie - ended up covered and looking like a prop from The Texas Chainsaw Massacre. Somehow our sweet and gentle cat had turned into some kind of feline Leatherface. Mrs. LIAYF gingerly moved it out to the back deck so yours truly could scrub off the blood later, but upon seeing it there when she returned from daycare Annabelle made a b-line for it with a smile. However, Mom got there first and quickly hurled the shopping cart off the deck and into the bushes, obviously thinking this was a good idea. Understandably that made Annabelle cry. And so......that is how I found myself not too long ago retrieving a bloody plastic shopping cart from the bushes next to our deck, and scrubbing mouse off of it. Obviously this was a Dad job. Of course, I found myself rather jumpy and irritated while doing so. Oh, and I while I was doing this scrubbing, I was also thinking about how I needed to be prepared for that earthquake. It's going to happen. Because the animals are acting pretty strange around here of late. Happy Star Wars Day readers. That's right, if you haven't already heard (and I'm surprised how many folks I mention this to haven't), today May the 4th, is Star Wars Day. Get it? "May the 4th Be With You!" 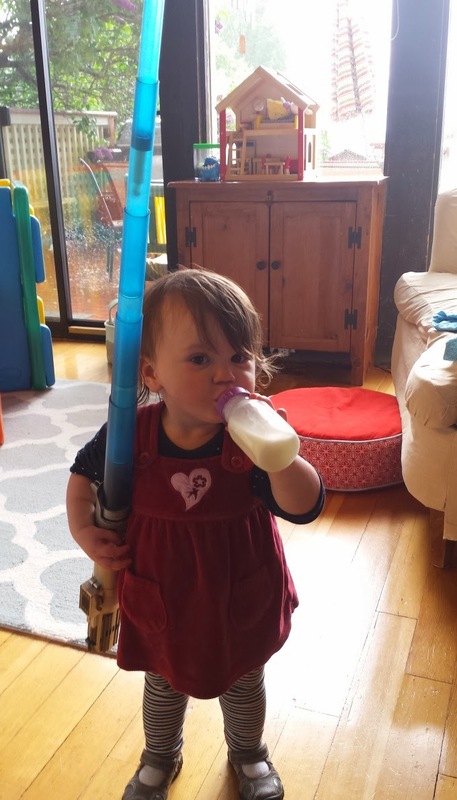 We have celebrated Star Wars Day with Lukas a couple of years running now, but this year was different in a pretty significant way. 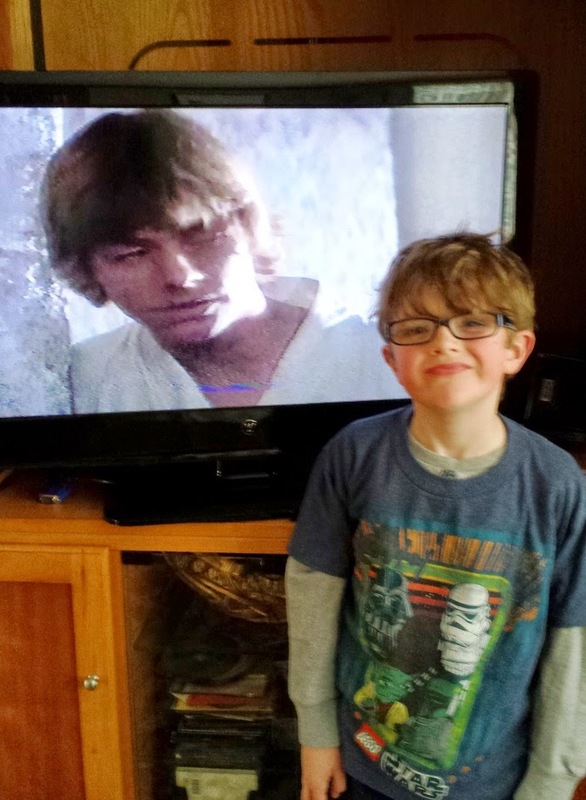 That's because this year Lukas is only a couple of months shy of his 7th birthday, which just happened to be the age that Mrs. LIAYF and I had previously decided was the right age to view the original Star Wars movie for the first time. But since it was Star Wars Day, and since we felt that he was finally ready emotionally, we decided now was the perfect time. After Lukas greeted his baby sister first thing in the morning with a hug and a resounding "Happy Star Wars Day, Annabelle!" 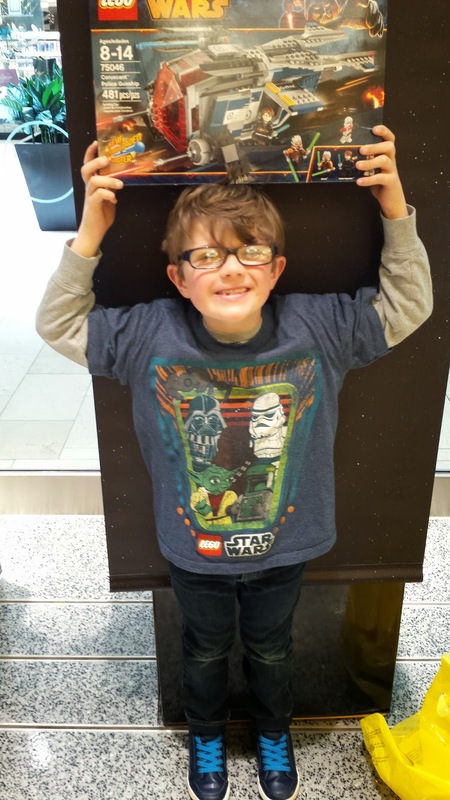 we had breakfast before starting our Star Wars Day with a trip across lake Washington to the nearest Lego Store, so that Lukas could spend his hard earned chore money (he gets 10 cents per household chore or homework exercise) on a new Lego set. He chose a Star Wars one, of course. It was a bit on the crazy side there, but we did come out unscathed and ready to head home for the main event. Once we were home and had lunch in our bellies, I put Annabelle down for a nap which hoped would last roughly 2 hours giving us enough time to watch our VHS version of Star Wars. Yes, we actually have one of those dual VHS/DVD players, although this was the first VHS tape we have watched in it in years. Don't laugh when the movie was made this was state of the art technology. We were all pretty excited, and Lukas was pretty quiet watching from his mother's lap. That is, until the scene came on where Obi Wan told the Imperial Storm Troopers in Mos Eisley "These are not the droids you are looking for". He laughed pretty hard at that. He probably remembered pulling this trick on his dad. At about half way through the movie, we had to take a bathroom break. It allowed me to snap this shot of Lukas, who dressed as Luke Skywalker two Halloweens running, next to his namesake. I see the resemblance, do you? Anyway, we had a LOT of fun watching Star Wars. Once it came to the movies climactic scene, I couldn't resist pulling out my phone to record his reaction. It's pretty cool, although I apologize for the quality and the sudden zoom near the end. We all loved watching this movie together. I hadn't realized how long it had been since I had watched Star Wars myself. My First time wasn't until after I had seen Empire and Return of the Jedi, so I was a wee bit confused until I was able to watch. Speaking of wee things, Annabelle, right on cue, woke up just as the movie was ending. She's perfect that way. And as I carried her into our kitchen and past her dollhouse - which she doesn't normally even play with - she reached out and and pointed towards it, letting out an audible request. As It turns out, there was something else sitting next to it which she wanted to play with instead. Makes sense. It was Star Wars Day after all. With the month of May upon us now, I am realizing just how many days of note there are surrounding the beginning of this month. Of course Mother's Day is on the horizon next week, and later in the month it's Mrs. LIAYF and my 15th wedding anniversary (exciting! ), so those are obviously very significant days of note. But on top of that, there are several other days this week which also afford the opportunity to mark special occasions. Not sure we will observe all of them, but in an effort to establish tradition in our household, I think Mrs. LIAYF and I are going to at least dabble in the buildup and celebration of some of these days. May Day is now behind us. The new director in my office is from Hawaii where they celebrate May Day as Lei Day, giving out fresh Lei's. That actually sounds a bit more fun than the May Day demonstrations which took place yesterday here in Seattle, where scheduled peaceful protests in support of immigrant rights and raising the minimum wage eventually gave way to anarchists who were just looking to stir up problems. 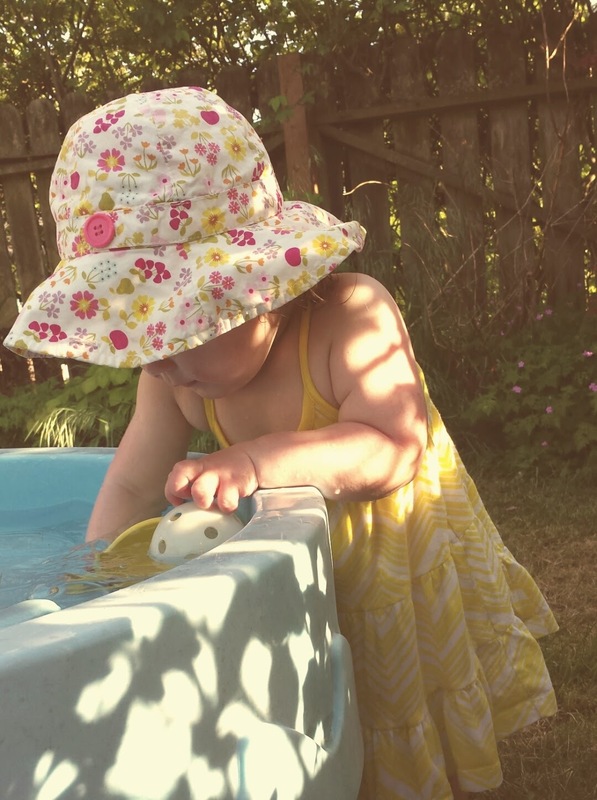 At the LIAYF household we celebrated record high May Day temperatures in the upper 80's with dinner on the deck and a refreshing backyard water table. For those of you who are unaware of this, Saturday, May 3rd is not only Derby Day, with the 104th running of the Kentucky Derby taking place (If we can spare 2 minutes this would be fun to watch), but it is also Free Comic Book Day. Free Comic Book Day is a terrific idea, and I would love to go and pick up some free comics with my son, but the problem is that there are no participating stores in our neighborhood. So, we will have to decide whether we are going to pack up and travel to another area of the city when there are several other competing activities to choose from. We'll see. Then on Sunday, May the 4th, it will be a big day for us here in the LIAYF household. As many of you know May the 4th is Star Wars Day (May the 4th be with you! ), and we plan on celebrating by watching the original Star Wars movie, also known as Episode IV, with Lukas. It will be his first time watching the movie and we are pretty excited here. Oh, and to top it all off, today is also Felix Day here in Seattle ( The King is on the Hill for the Mariners). Happy Felix Day all! All in all, it's look like a fun month is in store. How do you all celebrate in May?